Homemade By Holman: Happy Easter! 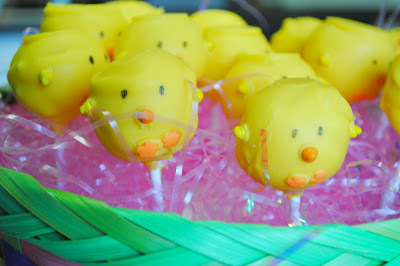 I made these cute little chicks a la Bakerella... I can't take any credit for the design but they were just too cute not to make. Cake balls are pretty straight forward but I always forget how much work they are. Make sure you have several hours to devote to these. For these I used a lemon cake, a lemon cream cheese frosting and Wilton candy melts for the coating. The lemon cake is the cake from the Triple Lemon Cupcakes and can be found here. Bake cake at 350 degrees in one 9" round pan or a square 8x8 pan. Let cool completely on a wire rack. In a large bowl, break cake into pieces and use two forks or your hands to crumble into small crumbs. Add 1/2 of the frosting and mix with a wooden spoon until well distributed. Mix should be moist and hold together easily when squeezed into a ball in your hand. Continue adding frosting until you reach the right consistency. Line a cookie sheet with wax or parchment paper and roll mix into balls approximately 1 inch in diameter. Once rolled, place cookie sheet in the freezer for at least 30 minutes. Once frozen, melt candy melts in a small, deep bowl by microwaving in 20 second increments, stirring between each. Once melted, dip just the end of a lollipop stick in candy and insert about half way into frozen cake ball. Return cake balls to freezer for about 15 more minutes. Reheat candy for another 20-30 seconds until smooth. 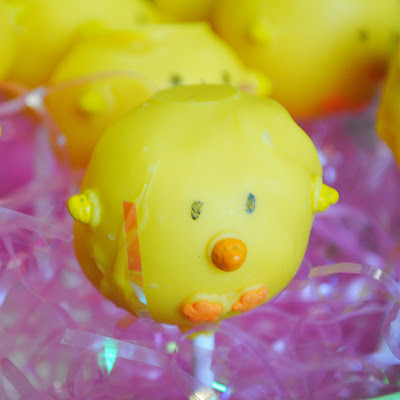 Dip cake pops one at time, twirling and tapping to remove excess candy and return to cookie sheet. Refrigerate at least 1 hour until candy coating has hardened. 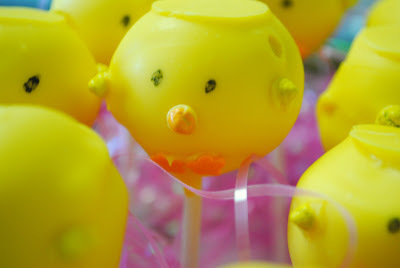 Decorate as desired using more melted candy coating to attach sprinkles and food pens to add eyes. To stand cake pops up, insert lollipop sticks into a styrafoam block. Beat cream cheese and butter until smooth, about 3 minutes. Add lemon extract and juice and beat until smooth. Add powdered sugar 1 cup at a time until frosting is thick. I love these little chicks. They are so much fun! 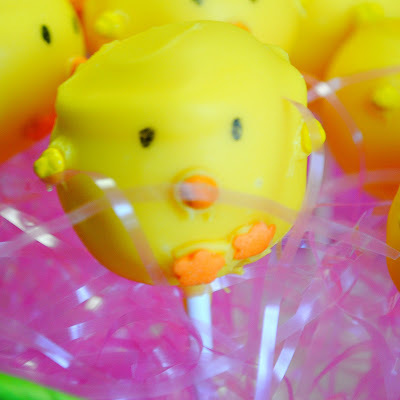 Your cake pops look fantastic! I like that you used a homemade cake instead of cake mix. Great job, and Happy Easter! I'm with Memoria I like that you made the cake instead of a box mix and used REAL frosting not canned goop with trans fat. I bet this were delicious!